The Barcelona-based company recently posted 91.3 percent accuracy in a 1,000-patient study. 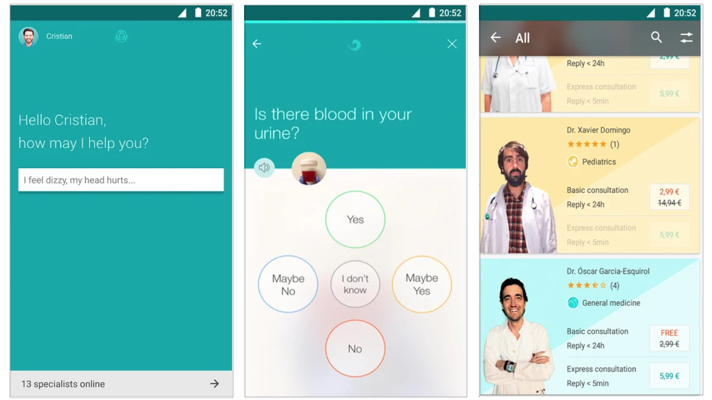 Barcelona-based Mediktor, which makes an app- and web-based symptom checker, has raised $3.46 million (€ 3 million) to support its continuing expansion into the US market. Alta Life Sciences led the round, with additional support from Castel Capital, Naos, and several other individual investors. Mediktor makes a non-diagnostic consumer-facing symptom checker for pre-diagnosis, triage, and decision-making support. Users can access the symptom checker online or via an app. The symptom checker is offered directly to consumers or as a whitelabeled product for hospitals and health plans. At the Health 2.0 session, US Managing Director John Pakutka laid out the case for coming to the US. “We spend somewhere between 30 and 70 percent on healthcare more per person than any other nation on earth. For all that extra spending, we see little discernible improvement in quality or population health outcomes,” he said at the time. Furthermore, the online symptom checkers that exist now don’t always take good care of people’s health data, he said. Mediktor’s white-labelled AI-powered symptom checker stores patient data securely and doesn’t use it for anything but sending to its clinicians, if users opt into a telemedicine visit, and training the algorithm. And the company boasts a level of clinical validation: the company has been working with Hospital Clinic in Barcelona and has already published data from a study of 1,000 patients that found the app to be 91.3 percent accurate. The study also showed that an average of 4.5 emergency room visits were avoided each 100 times Mediktor was used. Decision-tree based symptom checkers like WebMD, have been around for more than 20 years. But the advent of AI has ushered in a new breed of AI-powered symptom checkers and triage chatbots with big ambitions. One of the most notable is Babylon, which recently announced that it is investing $100 million (75 million pounds) to double its London team of scientists and engineers, expand its capabilities, and apply artificial intelligence to assist with management of chronic diseases. Though in use by the NHS, that chatbot hasn’t been without controversy. In June, Unite, the largest trade union in Britain and Ireland, called on the government to scrap the service in a letter to former health secretary Jeremy Hunt, signed by more than 130 health professionals. Here in the US, Buoy Health, has recently begun high-profile partnerships with Boston Children’s Hospital and CVS MinuteClinic. WebMD has also overhauled its symptom checker in recent years to compete with new blood in the space.